MedicareSavingsCenter.com is an independent Medicare insurance agency founded by Alex Wender. We specialize in helping folks across the country save money on their Medicare supplement insurance. We work with all the top-rated carriers across the country and do everything in our power to ensure no client pays more than they should for the coverage they receive. 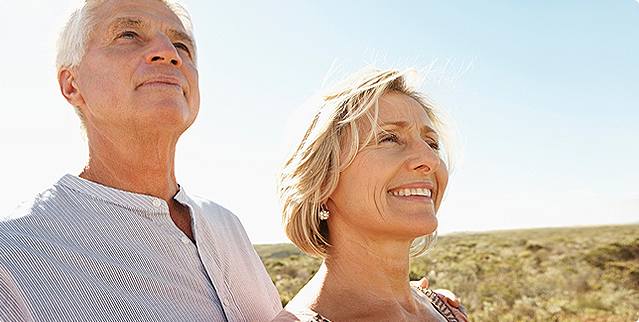 There are 10 Medicare supplement plans to choose from. They are identified by a plan letter and they range from plans A-N. Technically, there are 11 plans because Plan F comes in the form have a high-deductible plan and is referred to as “High deductible Plan F”. The most popular plans are F, G and N. These plans make the most sense to buy when you compare cost vs. benefit across all the plans. How Are Medigap Plans Unique? Medicare supplement insurance also known as “Medigap” is a unique health insurance plan because the policies are standardized by the government and CMS. This means the coverage and benefits are identical no matter what company is offering them. For example, Plan F is exactly the same weather it is being offered by AARP, Blue Cross, Aetn, etc. The only difference between each company is the price. If you are turning 65 or if you are older and have not yet enrolled onto Medicare Part B you are eligible for “Medigap Open Enrollement.” This period starts the first of the month you turn 65 and lasts for 6 months. During this period you have the ability to purchase any standardized Medigap plan, regardless of your health. 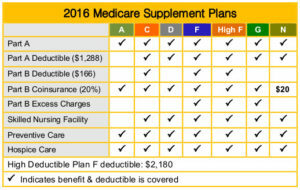 If you are retiring or losing group coverage and you already have Medicare Part B then you have the ability to exercise your “Guarantee Issue” right which allows you to buy a Medigap Plan A, B, C, F, K, or L that’s sold by any insurance company in your state. Using your guarantee issue right, the insurance company cannot ask you any health questions and cannot deny you or raise your premium due to any past or present health conditions. In addition, all pre-existing medical conditions must be covered. We work with folks in all different types of Medicare situations across the country. Weather you are in California, New Jersey or anywhere in between we can help you! We work with all the top-rated carriers and we are not married to any one company. This allows us to offer the most competitive rates. In addition, we conduct annual rate reviews with all our clients. This ensures you will never overpay for your coverage.